One trend that has been occurring with more frequency for quite a few Orange County, CA companies is the use of independent contractors instead of hiring new employees. As is the case with almost all companies these days, the most important item to worry about is the bottom line, and payroll is a huge part of that, hence, the increase in hiring independent contractors. Learn more about how professional liability insurance can help protect your Orange County business! Orange County, CA companies usually will hire an independent contractor for a specific project, and since they did not have to hire them as an employee, they will have paid no benefits, thus, adding to their bottom line. The consulting world, as a result of this industry change, has experienced a rather large increase in business over the last ten years in the Orange County, CA area. Whether your Orange County, CA company is in the professional services industry in such diverse areas as a Web Designer, Project Manager, Event Planner, Management Consultant, Media Consultant, or one of the numerous other professions there are here, your first step should be to acquire a CA Professional Liability Policy. This type of insurance coverage will be extremely important as a tool to protect your company should it find itself with a claim filed against it for any alleged or actual damages due to the company’s error in the services provided. We advise our clients and help them to understand that in almost every instance, Professional Liability Coverage will be excluded in their General Liability Insurance Policy. In the insurance program we present to our clients, we recommend that both coverages be acquired. In reviewing what limits of insurance coverage would serve your company’s needs the best, your first priority will be to review what your current and future clients’ needs are, the risks associated with those accounts, and to make sure your company is well covered for those types of risks. When you go out on your own, all the responsibility falls on you, should you not plan properly in not securing the right amount of coverage, you could find your company being put out of business should a claim being filed against your company and then awarded a large settlement against it. In having Professional Liability Insurance, this type of coverage will protect your company against the failure to perform, financial loss, and error or omission of the services or products that are sold by your company. Additional coverages that may be added to your company’s insurance program are breach of warranty, security, intellectual property, and cost of contract, to name a few. In most General Liability Insurance Policies, the coverage will extend to cover claims such as property damage, personal injury, bodily injury, or advertising injury. Professional liability Insurance Coverage is a form of liability insurance that will help protect either an individual or a company in the professional advice and service-providing business from absorbing all the costs associated with the cost defending against a negligence claim made by a client and damages awarded in such a civil lawsuit if they were awarded against your company. liability Insurance Coverage focuses on alleged failure to perform on the part of, financial loss caused by, and error or omission in the service or product sold by the policyholder up to the limits of the insurance policy. These types of insurance policies are almost always issued on a claims-made basis, meaning that the policy will only cover claims made during the policy period after the retroactive date up to the policy limits. Specifically, most Professional Liability Insurance Policies will provide indemnity to the insured against loss arising from any claim or claims made during the policy period by reason of any covered neglect, error or omission committed in the conduct of the insured’s professional business during the policy period up to the limits of the policy. Please be aware that any claims that may relate to incidents occurring before the coverage was active, in most cases, probably will not be covered, although most professional insurance policies will have a retroactive date. If you are a professional consultant, then it is expected that either you or your company will have an extensive technical knowledge or training in your area of expertise, performing the services for which you or your company were hired, according to the standards of conduct in your or your company’s chosen profession. If there is any failure in the level of skill expected of your company, it could very well result in your company being held liable for damages. Regardless of the professional services you or your company perform, such as Management Consultant, Media Consultant, Web Developer, Event Planner, Property Manager, or one of many other professions that call Orange County, CA home, acquiring a Professional Liability Insurance Policy is a must for protecting you or your company. This particular insurance coverage will provide your company protection in the event you are held liable for damages due to your error of those provided services. 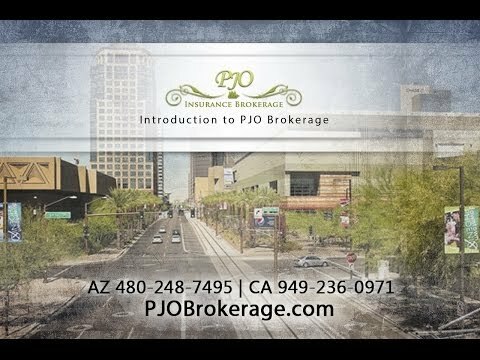 To learn more about how Professional Liability Insurance can be an asset for you or your company, please contact the experienced and professional brokers at PJO Insurance Brokerage.